Strengths:	 Straightforward advice for beginners. Reviewed by Ozone on Oct. 19, 2005. 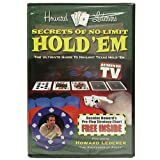 The "Professor of Poker", Howard Lederer, teaches viewers the basics to no-limit hold'em tournaments. Topics covered ont his DVD range from how to run a home tournament to how to pick up on a tell when playing against a world class player. Don't expect to find many "secrets" of No Limit Hold'em on this video...unless you consider advice as "everyone is dealt two cards face down" a secret. Instead, expect to learn the raw basics of no-limit hold'em. This video is pretty worthless for anyone who isn't completely new to the world of poker. That in mind, this DVD would make a great gift for someone who has expressed an interest in learning about poker due to the big "poker boom" in the past few years. In each DVD case are a few charts compliments of Howard Lederer. Howard spares no expense by including his "preflop strategy" chart that outlines what hands are allowed to be played, and what hands must be folded. Anyone slightly versed in poker knows that tournament preflop strategy cannot be summed up in a small sheet of paper. Nevertheless, the chart would be pretty benefitial for a clueless new player trying to get their feet wet. The middle sections of the DVD cover betting strategies in tournaments as well as how to play each street of a poker hand. Howard explains how increasing blinds will effect your play, as well as how one must tighten their hand requirements towards the middle stages of a tournament. The DVD ends by showing viewers common tells made by players in tournaments. These tells are likely a very popular section of this DVD and should entertain the new players infatuated with the dream of calling a big bluff. The presentation of Howard's advice is quite bland. Most of the video is shot with Howard sitting at a poker table talking to the camera. Howard is the only person talking in this video, which helps viewers feel as though "the Professor" is talking directly to them. Howard does a nice job of speaking clearly to the camera and giving off a trustworthy image. This isn't a sleazy "get rich quick" poker DVD. At the same time, it can be quite boring if you already know the basics of no-limit tournament poker.